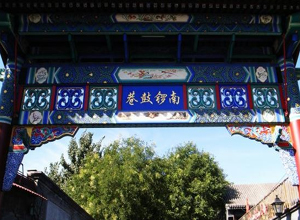 Located several kilometers north of the Forbidden City and just east of HouHai Lake is NanLuoGuXiang, an 800-meter long North-South alleyway filled with cafes, bars, and shops all designed in classical Chinese ‘hutong’ style. NanLuoGuXiang has a history of over 800 years. Once a flourishing commercial street during the Yuan Dynasty (1206-1368), the NLGX area became a popular residential area for government officials and elites during the Ming (1368-1644) and Qing (1644-1911) Dynasties. Organized in the traditional Chinese courtyard style, many of these residences still stand today. NanLuoGuXiang is intersected by eight East-West hutongs, each with its own unique bit of story to tell. Amidst the destruction of many old Beijing historical neighborhoods in recent years, NanLuoGuXiang was spared and designated by the Beijing government as a historical site for preservation and showcase for Chinese culture. The area received a face lift in early 2006 – the hutong road was paved with grey bricks, storefronts were renovated, and cafes and shops were opened – and the area has since evolved into a favorite spot for local hipsters, musicians, freelancers, and tourists.